For some types of processes, it is necessary to monitor temperatures of materials subjected to high gas pressures. Conventional contact devices are difficult to employ under these conditions and conventional IR devices are unsuitable because their optical and electronic components are unable to withstand high pressures. With its elegant simplicity and solid construction, the IRt/c provides a solution. It has been tested at pressures up to 5000 psig (340 bar). 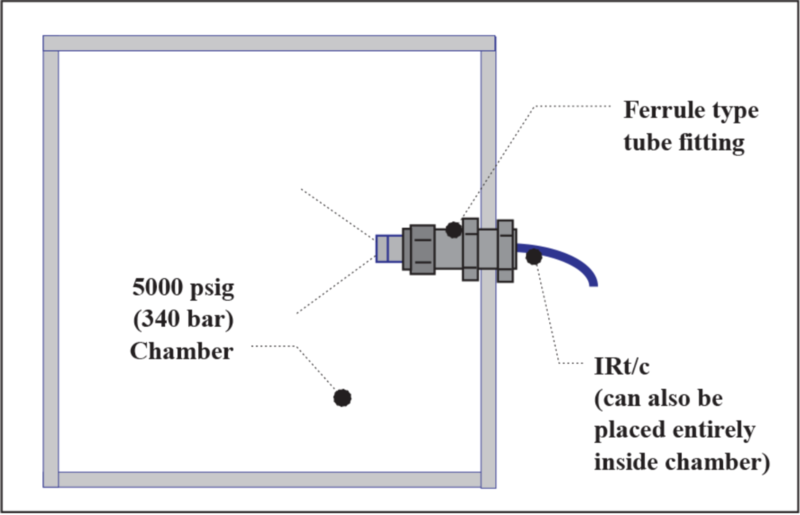 A simple ferrule type tubing fitting may be used to provide a pressure-tight seal around the IRt/c housing. If using an IRt/c model with a lensed optical system (IRt/c.5; IRt/c.10; etc. ), pierce the lens at its edge with a needle to provide pressure equalization.